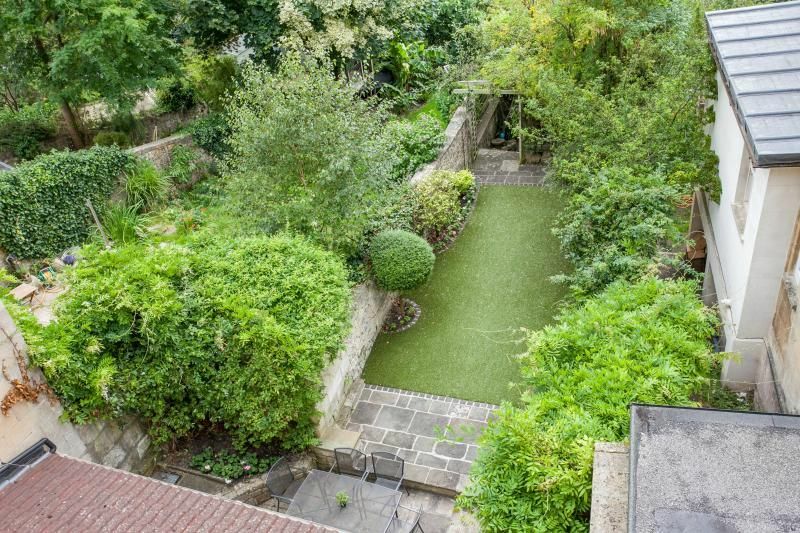 This gorgeous Bath home is a hidden gem. 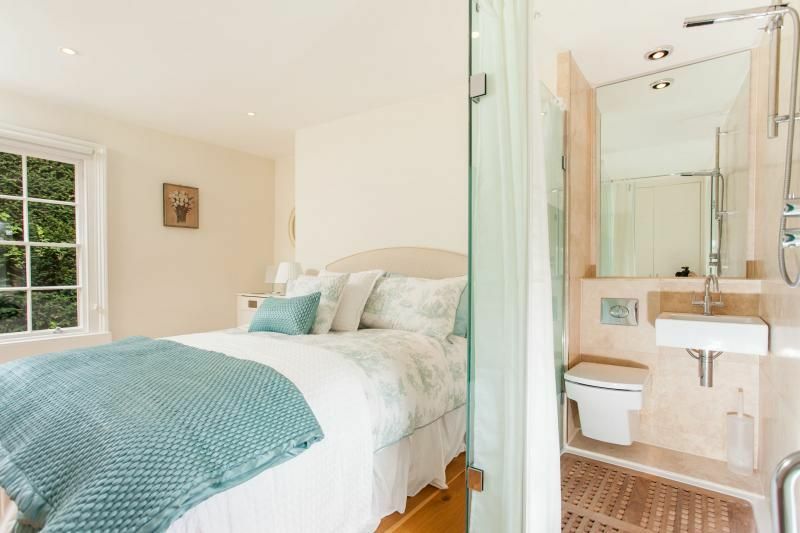 Nestled in a beautiful, historic and exclusive enclave of Bath and yet only 10 minutes walk down to the city centre, it has 4 stylish bedrooms, 4 smart bathrooms, a pretty walled private garden and sweeping vistas across a national trust landscape. 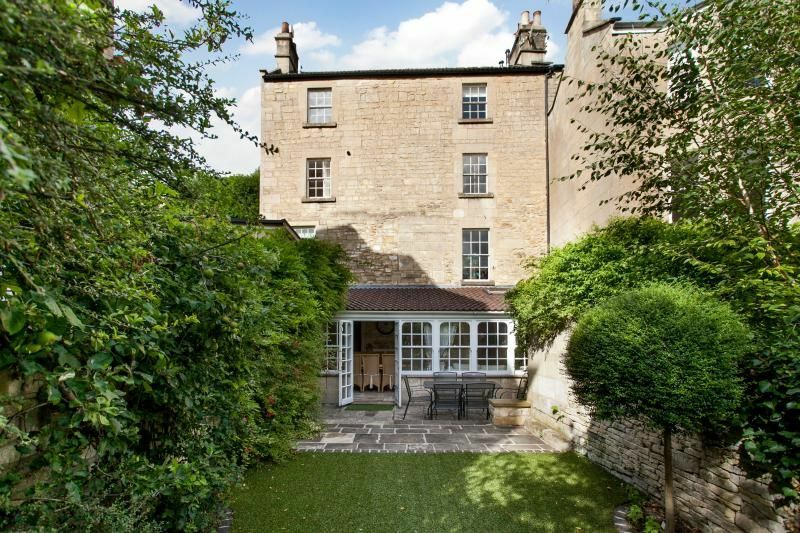 Warm, inviting and beautifully furnished, this picture perfect Bath stone house has spacious accommodation over 4 floors with lovely period details on every level. Throughout the ground floor are high ceilings with smart cornicing, deep shuttered window bays with pretty window boxes and ornate decorative fireplaces. A living room on this floor has a leather sofa to seat 2 along with 2 cosy armchairs. A large TV swings out from alcoves placed either side of the fireplace. Across the hall is an elegant French style dining room to seat 8. A grand table, dressy chairs and a long elegant console and shelves (with Wi-fi.) give this room a sense of occasion. 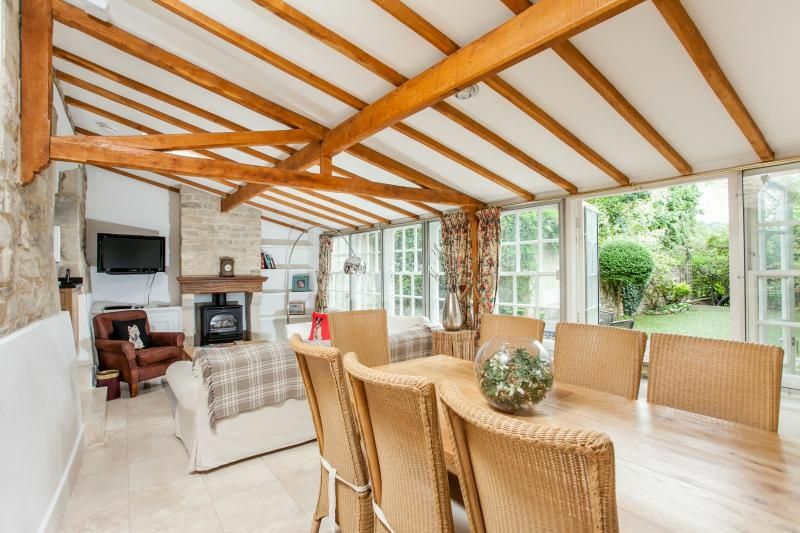 Downstairs is a marvelous gathering space with a large handsome open plan kitchen leading to a beautiful and atmospheric oak beamed living and dining area with French doors out to the garden. A spacious lobby tiled in smooth travertine has a well organised utility on one side and a smart fitted oak kitchen with black granite tops on the other. These areas have under floor heating, creating a warm and inviting environment. 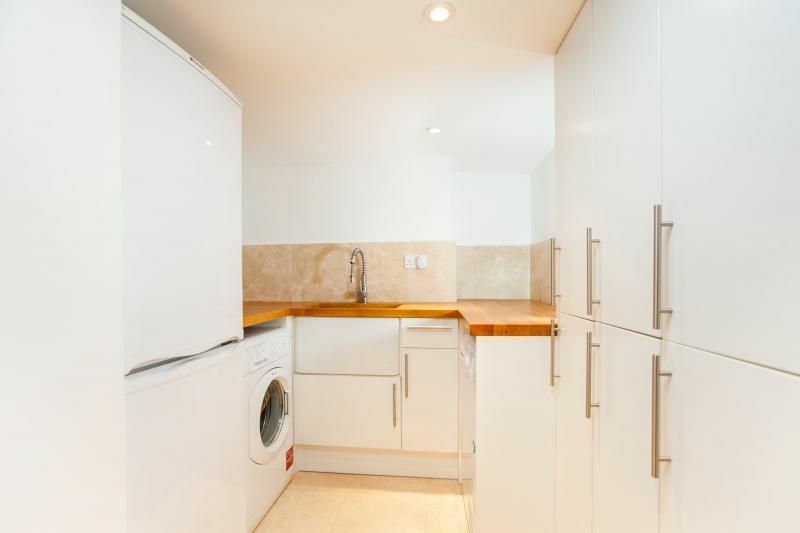 The fitted utility has excellent facilities including a deep sink set into the worktop, lots of neat storage, a large fridge and separate freezer, a washing machine and separate dryer and other domestic items. 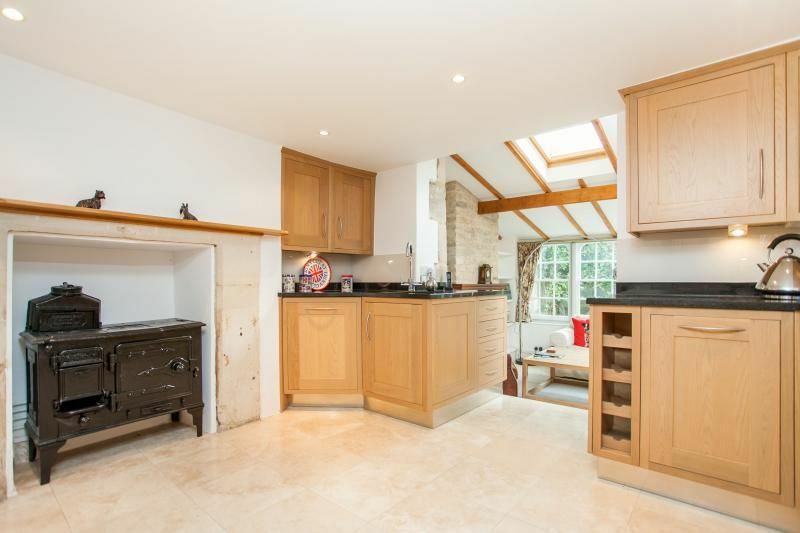 The contemporary fitted kitchen has oak units with rich black granite worktops and features the original cast-iron range set in a deep stone fireplace with an oak mantle above. There is a 5 ring gas hob, electric oven, microwave, dishwasher, small fridge and plenty of top quality crockery and bake ware. The kitchen has steps down to a gorgeous Italianesque living and dining area with windows onto the walled garden along the length of one wall, a double height sloping ceiling with oak beams and an evocative mix of Bath stone walls, wood floors and natural furnishings. The Living room end has a working coal effect gas fire, fitted into an original fire-place with deep alcoves on either side housing a TV with DVD, digital radio, and a selection of books and films. In front is a vast comfortable cream `L` -shaped sofa to seat up to 7, coffee table and a cosy leather armchair. The oak dining table comfortably seats 8. At the far end of this room, fitted neatly under the stairs is a fully tiled travertine cloak room with hand basin and WC and a separate shower room. Take a bottle of wine into a pretty walled garden lined with climbing wisteria and mature shrubs and listen to the wind in the trees. There is an outdoor table with chairs to seat 6 and further down is a hidden loggia with a outdoor table and chairs for 4. The stylish Bedrooms on the first and second floors are charming. 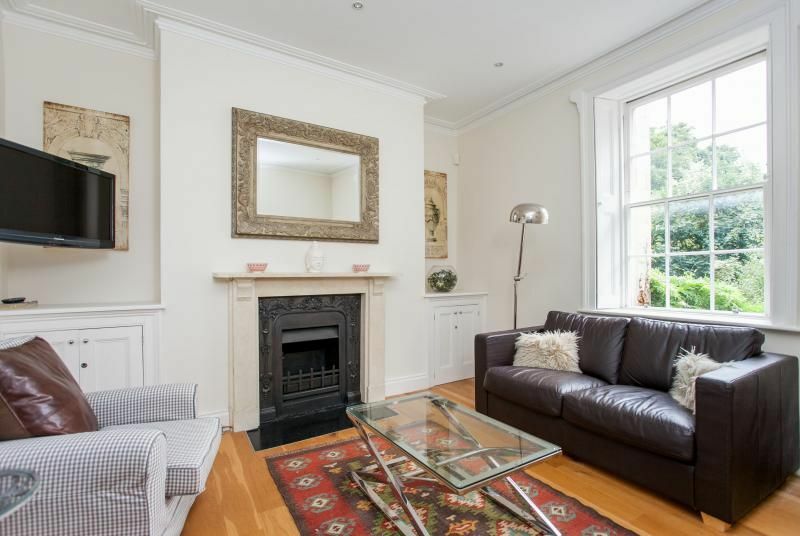 They all have original decorative fireplaces, large sash windows and sweeping views over the vale with tremendous trees, rolling green hillside, pretty gardens and a tumble of Bath stone houses in the distance. 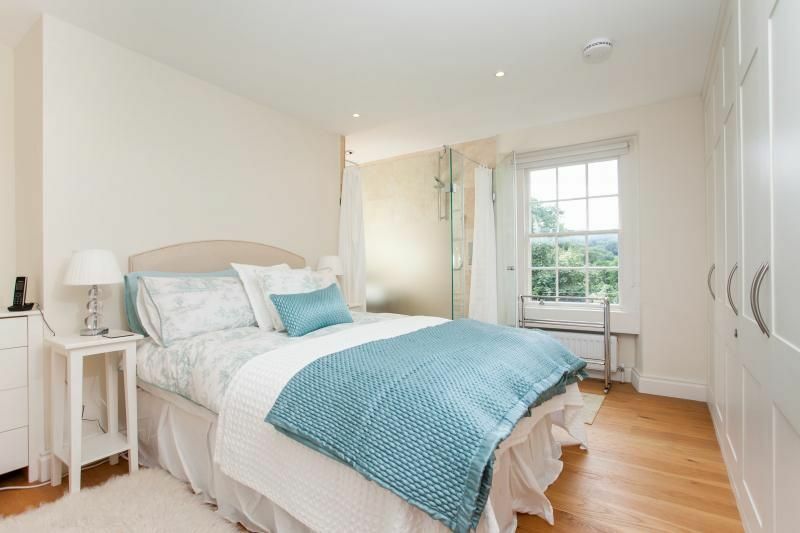 The first floor has a lovely elegant toile mint-green double room with a 4`6`` double bed, fitted wardrobe and alcove with fitted drawers and mirror over. Tucked in the corner is a travertine tiled, contemporary wet room, neatly housing a hand basin, WC and shower over a fitted duck-board. 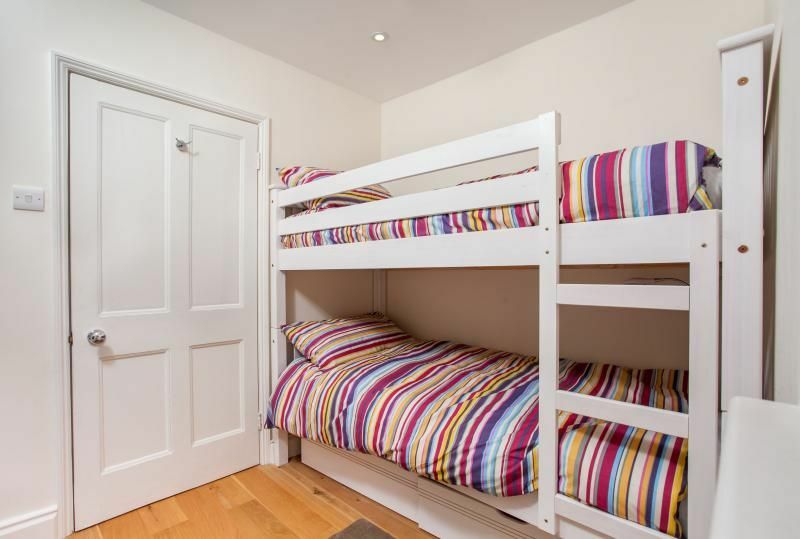 Across the landing is a sweet candy-striped bedroom with a wooden bunk-bed best suited for children or the young at heart. A fitted cupboard provides storage with shelving over. 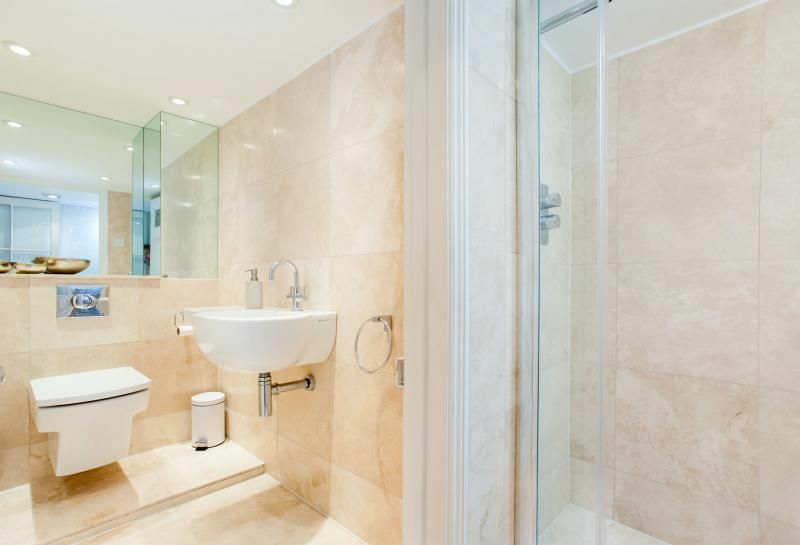 On this floor also, is very spacious contemporary bathroom tiled throughout in smooth travertine. It has a large deep bath tub with a floor standing tap and hand held shower attachment, a large hand basin and a WC. The second floor has a spacious double room in fresh pink and plum, with a 4`6`` double bed, a fitted wardrobe and chest of drawers. In a corner of this room is a travertine tiled contemporary wet room with hand basin, WC and shower over a fitted duckboard. The landing between rooms has a pretty desk and chair with tranquil green vistas in front of the house. 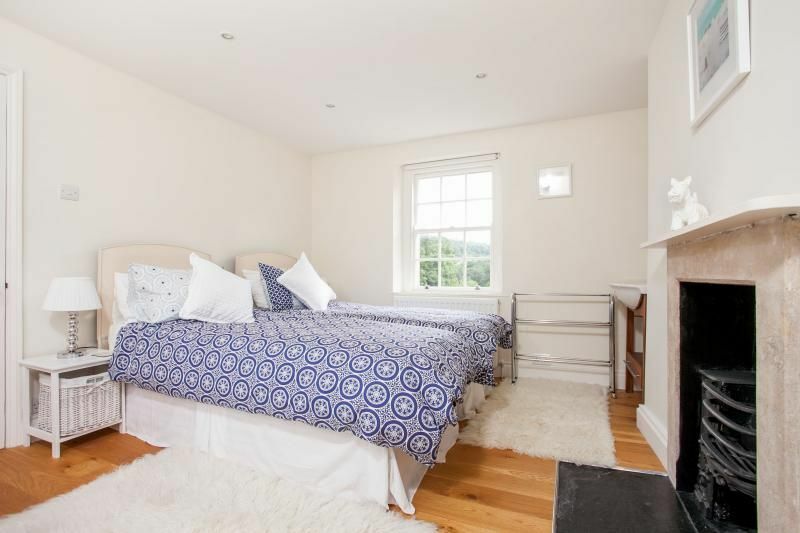 A crisp blue twin room across the landing has two single beds that can zip and link to become a double. In this room is a fitted wardrobe, a chest of drawers and neatly housed in an alcove, is a stylish walnut mounted hand basin with a mirror over. There is a permit for one car allowing you to park on the street or on neighbouring streets. Alternatively the Bath Spa train and bus stations are a ten minute walk away. Additional parking may be arranged at additional cost. If you want to take a break from the city, there is much to explore from the house. Close by is the tiny and atmospheric church of St Thomas a Becket built between 1490 and 1498 over a Norman church with even older Saxon origins. This tiny settlement was mentioned in the Domesday survey of 1086. Farther along is Widcombe Manor a fabulous grade 1 listed manor built in 1656, visited by the rich and famous. Nearby is the National Trust owned Prior Park Gardens with a Palladian bridge created in the 18th century by local architect and entrepreneur Ralph Allen with advice from Capability Brown and the poet Alexander Pope. 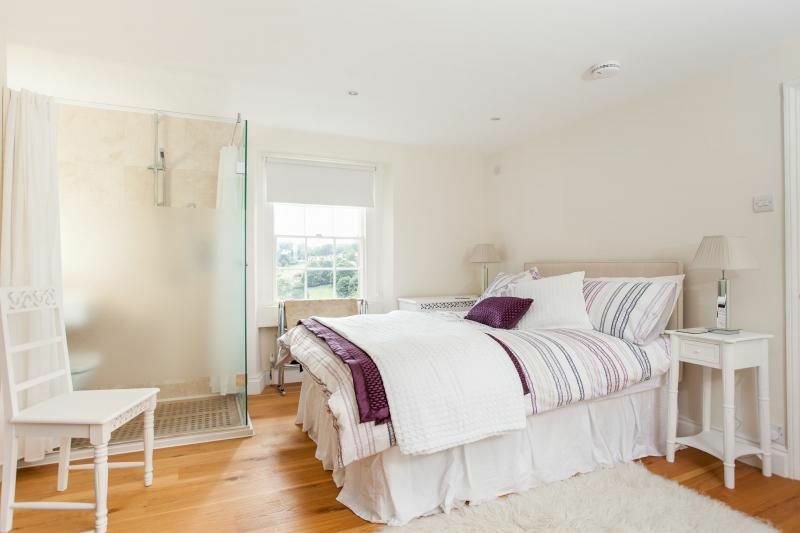 There are fabulous views of Bath and a five-minute walk leads to the Bath Skyline, a six mile circular route encompassing pretty woodlands and meadows, an Iron Age hill fort, Roman settlements, 18th century follies and spectacular views. The local facilities in Widcombe Parade are very good and include a newsagent, chemist, a couple of coffee shops, hairdressers, florists, and several pubs, restaurants and Indian, Chinese and American takeaways. The nearest supermarket is Sainsbury`s. Nearby Prior Park Garden Centre is great for lunch as well as having a deli, pets, plants cards and gifts. The City has many historic sites and museums and galleries, as well as great shops, bars and restaurants. Bath Narrowboats rent barges and bikes to explore the city or the Kennet and Avon canal and towpath. After all the activity, pamper yourselves in the piping hot pools of the Thermae Spa, or enjoy a night at The Theatre Royal or Komedia Comedy Club. 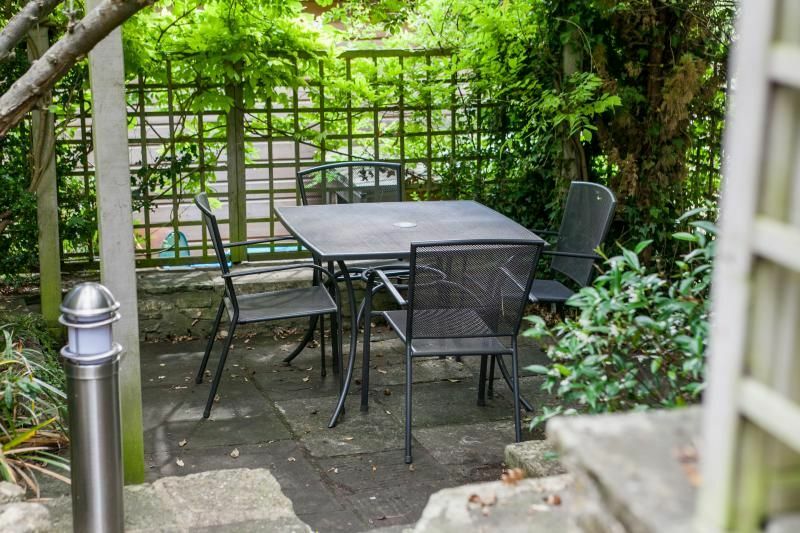 The property meet our expectations and was well located within walking distance of the main City of Bath as well as 3 local pubs. We would recommend to all to use Bath Holiday Rentals and we will do so again this year. We stayed at the above property with three generations of family to celebrate daughters milestone birthday. The accommodation was very clean and comfortable and suited our needs perfectly. A big thank you to Marcus for organising our arrival at the property to run smoothly. He was very professional and friendly. The decorated Christmas tree made it special from the start. 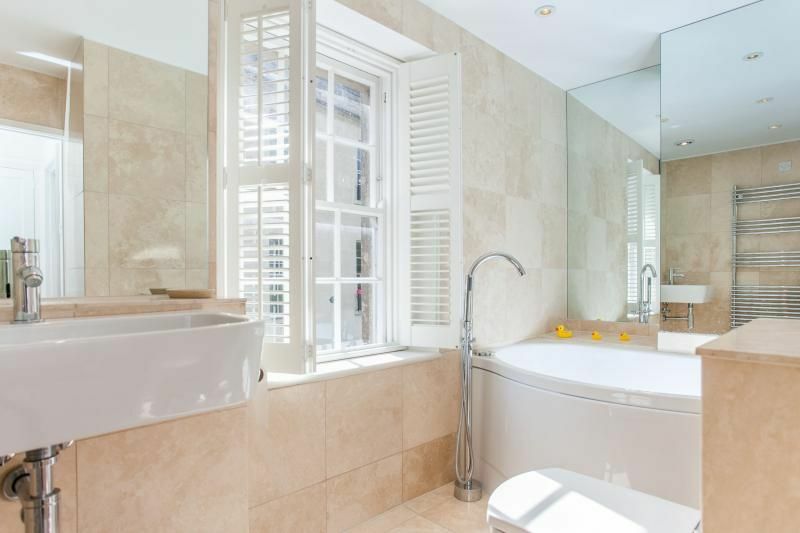 We can definitely recommend Bath Holiday Rentals and if visiting Bath again would stay in one of your properties. We stayed at 3 Church Street over the weekend (we left yesterday evening) and on behalf of our group, I would like to say how amazing the house was. We loved our weekend in Bath and the house was perfect for our stay. Thank you for our welcome pack when we arrived and a huge thank you to Marcus who was very helpful in showing us around and quickly finding us a replacement light bulb for the dining area! If we visit Bath again we'll definitely be back in touch! Bath Holday Rentals, and Marcus in particular, were extremely professional and accommodating from start to finish. I booked Church Street House to celebrate my wife's significant birthday with all my family including my daughter who flew over specially from Australia. 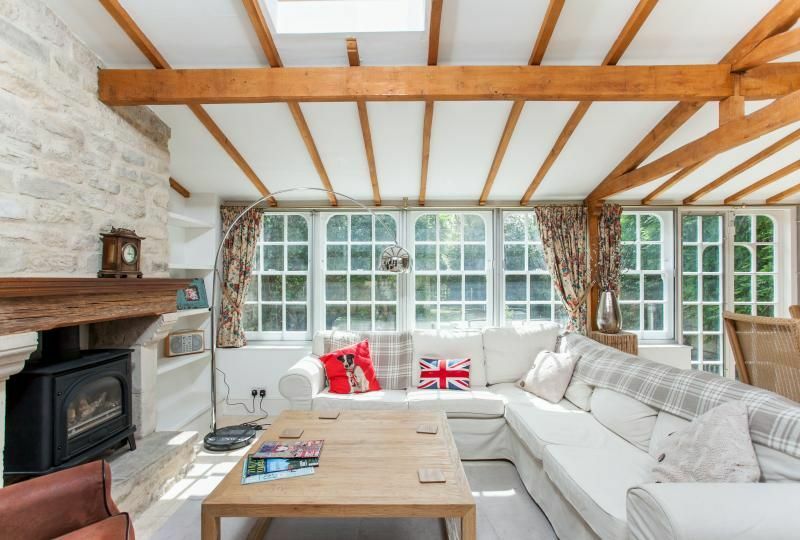 The house is a lovely 4 bedroom property located in a very quiet area some 15 minute walk from Bath railway station . Parking isn't a problem but the street is extremely narrow with just about enough room for other cars to pass. 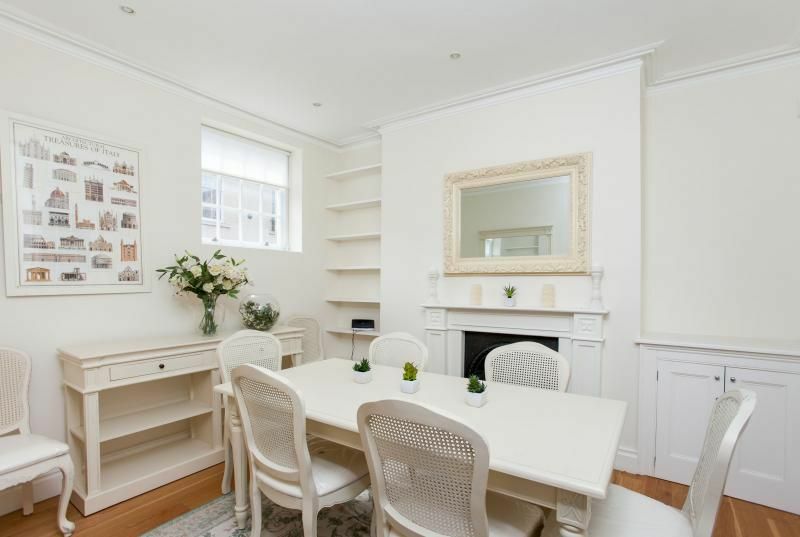 The house is set over four floors and is decorated to a high standard with quality fittings. We tended to use the lounge area next to the kitchen most of time as it is very family orientated. The small adjoining walled garden was also a perfect play area for our two year old grandson. All in all, the house proved the perfect choice and Bath Holiday Rentals a company which offers a very high standard of customer service. we all had a fantastic time and the house was gorgeous- we were all really impressed and loved the location. Thank you for making our get-together such a memorable one, we shall be recommending Bath Holiday Rentals! Thank you the most wonderful stay in bath. The house was beautiful and close enough to the town centre. What makes the house is the gorgeous room downstairs. We could all relax in one place and it was perfect for us. The only thing which we didn't quite get the hang of was the smart shower/ toilet but as there was another shower and bathroom - this didn't affect us that much. The house was immaculate and leaving tea, coffee and cereal etc was a lovely touch. Our stay at Church Street was absolutely marvellous! We had everything we needed, from hairdryers to comfy beds and the rest. The house is tastefully decorated and felt like a real home from home, just what we all needed. All the help and advice we got from Olivia was greatly appreciated. Thank you! Great house, catered for all our needs. 7 old school friends just catching up! Good location. Thanks for the use. We recently stayed for three nights at Church St House and despite the weather, had a really relaxing and enjoyable stay. 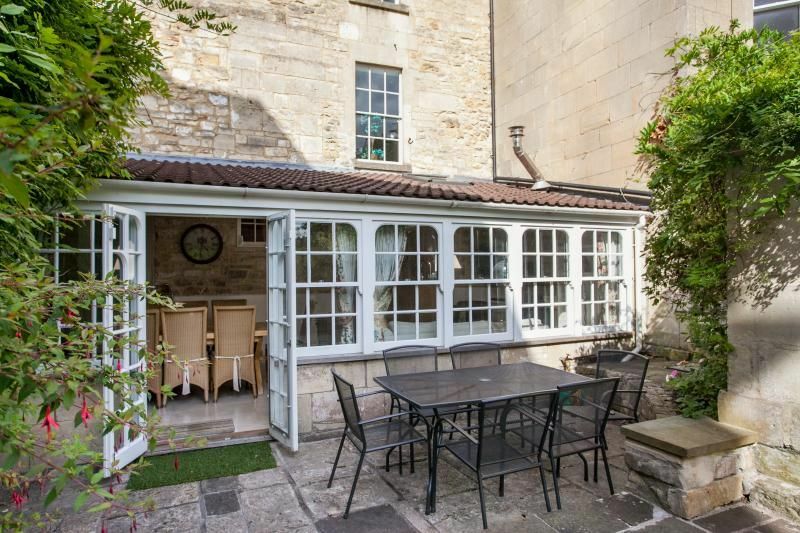 The property is very comfortable with space for far more than the three of us and oozes with character as well as being ideally situated to enjoy all that Bath has to offer. We really felt at home and would stay there again. 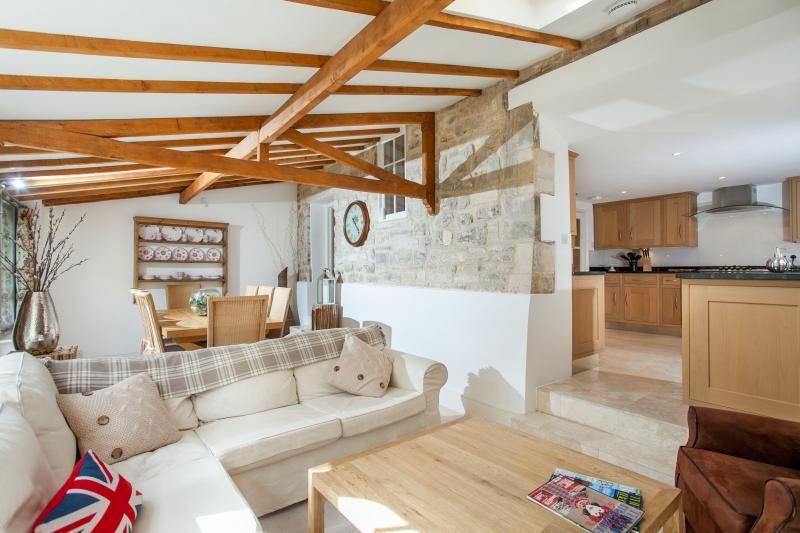 Your service and particularly Olivia’s welcome was up to the usual high standard and we look forward to using Bath Holiday Rentals again in the near future as we have done for a number of years. This is the second time we have used Bath Holiday Rentals and we have had another excellent stay. The house was exactly as described and suited the needs of a three generation family celebration perfectly. Lovely welcome hamper and high quality fittings, linen, toiletries throughout. The situation suited us as the house was close to Thomas a Becket Church and Prior Park Gardens, which were the focal point of our visit to Bath on this occasion. It is quite a hike back up the hill from the city centre though, so worth bearing this in mind. Olivia was very helpful and flexible with our arrival and departure times, which was great. We would highly recommend The White Hart at the bottom of Widcombe Hill - we had a couple of excellent lunches there. We were born and brought up in Bath and love the city. In the past we have stayed in hotels but when we return in the future, we will always try and book a property with you. We had a fantastic stay at Church Street, the house was absolutely beautiful and so well located. Olivia was extremely helpful with recommendations for restaurants etc, and the information at the house was very useful too. The downstairs room off the kitchen was stunning and ideal for entertaining. The bedrooms so comfortable with beautiful bedding. I would thoroughly recommend this house and would love to return. Many thanks for all your help and for making our stay such an enjoyable one! I am just emailing to say a huge thank you for a very pleasurable stay at the above property. Right from the start, from the booking right through to the end of our stay, everything went smoothly. The house itself was beautiful and equipped fantastically. We feel we were extremely fortunate to have found this gem within Bath. I thank you again and I will definitely be coming back and am already telling many others to go to your website. Church Street House is fabulous - it helped make our long weekend in Bath. We all agreed it was top notch s/c accommodation with everything provided that you could possibly need for a short or long stay. 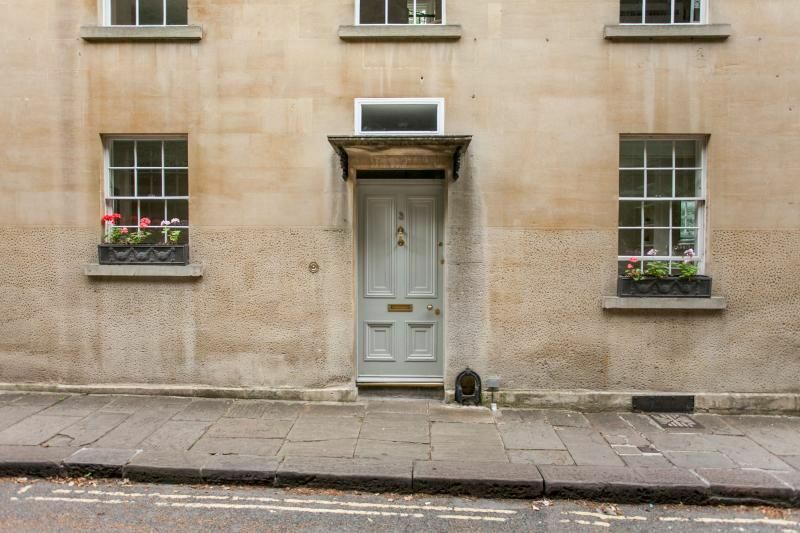 The quiet location - Widcombe Hill - away from the centre of Bath, was just what we wanted but getting into town on foot was easy and by taxi - even easier. Lovely views from the bedrooms and the small garden were a real bonus. All the stairs make it challenging for anyone with mobility issues and it's probably not suitable for anyone with small children. We will definitely be back. Our family spent a very enjoyable Christmas week at Church Street. It is a lovely and very well appointed house with a luxurious feel and everything you could want for a very comfortable stay. The delightful rural views from the back belie the fact that you are only a 10 minute walk from the city centre. The house could not have been more perfect. 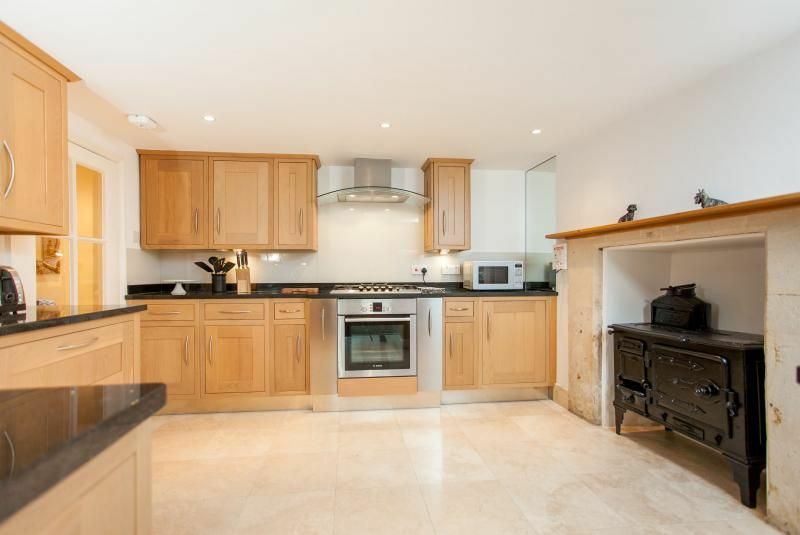 It is ideally located just a 10 minute walk from Bath Spa train station and all the shops, bars, restaurants, the Christmas market (we went in late November) and the Spa a few minutes further. The house itself was really clean and tidy and comfortably accommodated our group of 8. We prepared a meal one night and found everything we needed, not a single thing had been missed. The decor was gorgeous and in keeping with the property and all the bedding and furnishings were crisp, clean and cosy. Everyone remarked on how comfortable and welcoming the house was and it really made for a special weekend.